Definition: Strategy Formulation is an analytical process of selection of the best suitable course of action to meet the organizational objectives and vision. It is one of the steps of the strategic management process. The strategic plan allows an organization to examine its resources, provides a financial plan and establishes the most appropriate action plan for increasing profits. It is examined through SWOT analysis. SWOT is an acronym for strength, weakness, opportunity and threat. The strategic plan should be informed to all the employees so that they know the company’s objectives, mission and vision. It provides direction and focus to the employees. Establishing Organizational Objectives: This involves establishing long-term goals of an organization. Strategic decisions can be taken once the organizational objectives are determined. Analysis of Organizational Environment: This involves SWOT analysis, meaning identifying the company’s strengths and weaknesses and keeping vigilance over competitors’ actions to understand opportunities and threats. Strengths and weaknesses are internal factors which the company has control over. Opportunities and threats, on the other hand, are external factors over which the company has no control. A successful organization builds on its strengths, overcomes its weakness, identifies new opportunities and protects against external threats. Forming quantitative goals: Defining targets so as to meet the company’s short-term and long-term objectives. Example, 30% increase in revenue this year of a company. Objectives in context with divisional plans: This involves setting up targets for every department so that they work in coherence with the organization as a whole. Performance Analysis: This is done to estimate the degree of variation between the actual and the standard performance of an organization. Selection of Strategy: This is the final step of strategy formulation. It involves evaluation of the alternatives and selection of the best strategy amongst them to be the strategy of the organization. Strategy formulation process is an integral part of strategic management, as it helps in framing effective strategies for the organization, to survive and grow in the dynamic business environment. Corporate level strategy: This level outlines what you want to achieve: growth, stability, acquisition or retrenchment. It focuses on what business you are going to enter the market. Business level strategy: This level answers the question of how you are going to compete. It plays a role in those organization which have smaller units of business and each is considered as the strategic business unit (SBU). 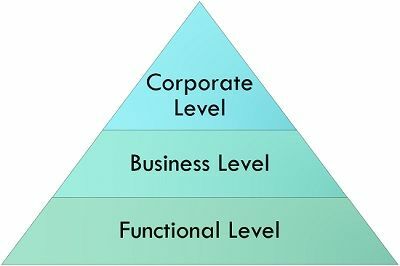 Functional level strategy: This level concentrates on how an organization is going to grow. It defines daily actions including allocation of resources to deliver corporate and business level strategies. Hence, all organisations have competitors, and it is the strategy that enables one business to become more successful and established than the other.